– The airport is operating as normal, with flights from and to all international destinations being carried out. – The island’s ferry connection with Piraeus has been re-established throught the port of Kefalos, located in the southwestern part of the island. – Ferry routes from/to the Dodecanese islands continue as normal through a pier near the main port of Kos. – Ferry connection to the coast of Turkey continues, while the Schengen zone security check point has been transfered near the main port of Kos. – All tourism programs organized by tour operators are carried out as normal, including the arrival and departure of visitors. – Tourists are staying in the hotels they had initially booked. In only a few cases – and until engineering inspenction is completed – tourists have been transfered to other facilities. – Hoteliers and staff follow the necessry procedures, in order to ensure the best possible care and services for visitors. 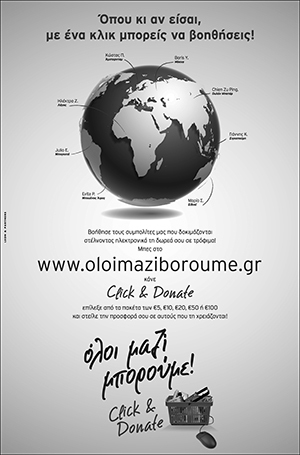 Moreover, the Ministry and the Greek National Tourism Organization (GNTO) have contacted foreign Embassies and GNTO’s offices abroad and have informed tour operators, travel agencies, airlines and other tourism professionals on the situtation. The minister of tourism has also informed the media, following a request by the country’s tourism bodies, regional and local authorities. Meanwhile, Hellenic Hotel Federation president Antonis Kambourakis said the island of Kos and its hotel infrastructure survived the earthquake, as Europe’s latest legislation on earthquake-proof standards has been applied. 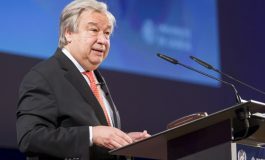 “By working with solemnity, responsibility, sensibility and respect towards its guests, Greece proved it is still a top European tourism destination,” Kambourakis said in an announcement. He also expressed his support to the families of the two victims. Kos is rapidly healing the wounds inflicted by Friday’s 6.6-Richter magnitude earthquake and “once again becoming the island of culture and tourism,” the general secretary for Greeks abroad Michalis Kokkinos told the Athens-Macedonian News Agency on Saturday. “A new day has dawned on Kos. We have woken from the nightmare and today airline connections and ferry connections have been restored (with ships docking at Kefalos harbour). Also, the locations that were damaged are being restored at a rapid pace, since a culture ministry team has arrived,” Kokkinos said. 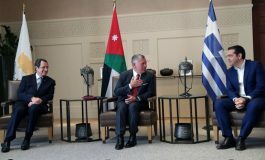 The general secretary was on the island in order to assist in briefing foreign diplomatic authorities about the way in which the Greek state, the Greek people and local bodies have responded to the earthquake. Kokkinos noted that the state had reacted quickly and with organisation, and that working with local authorities, the region, the municipality and the island’s inhabitants it had done the best possible. “Kos responded with humanity, speed and efficiency to a nightmare and is now turning a page and is a safe and favourite location of culture and tourism and a favourite world destination,” he added. No one had been absent in this fight, the general secretary said, with the citizen protection ministry, infrastructure ministry, shipping ministry, culture ministry, tourism ministry, health ministry, media ministry, regional authority, municipality, hoteliers’ union but also ordinary Kos residents all playing their part and assisting. There were no cancellations by the large travel agencies, Kokkinos added, while normality was returning. “Today another day has dawned and tomorrow will be a better day,” he said. European Parliament Vice President Dimitris Papadimoulis on Saturday asked the European Commission for the immediate and full restoration of damages and the support of earthquake victims via the European solidarity mechanism for natural disasters, following Friday’s strong earthquake on the island of Kos. In an urgent question to the Commission, Papadimoulis said the earthquake had left two dead and several injured, as well as inflicting substantial material damage. Immediately activate the solidarity mechanism for natural disasters and finance the sum of the damage caused? 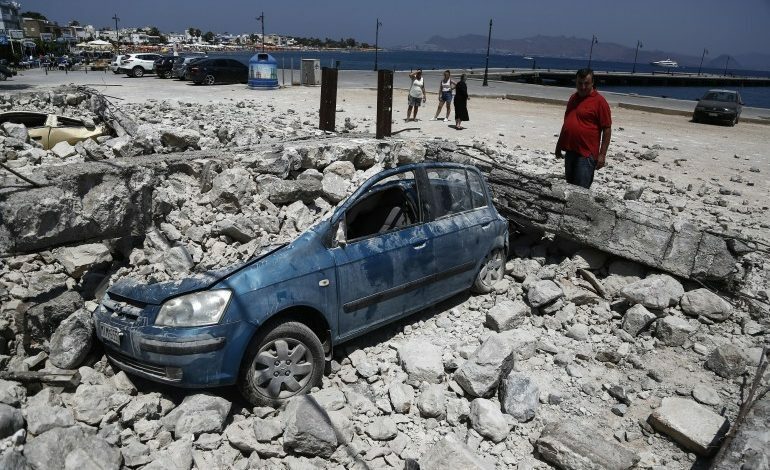 A delegation of three MPs sent by main opposition New Democracy arrived on the island of Kos on Friday evening in order to be briefed on the extent of the damage caused by the earthquake that struck in the early hours of Friday morning. 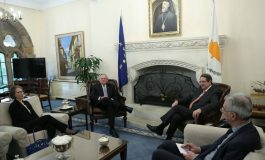 The party’s team included the MPs Makis Voridis, Kostas Karamanlis (in charge of the infrastructure portfolio) and Manos Konsolas (tourism portfolio). Accompanied by S. Aegean Region Governor Giorgos Hatzimarkos and the head of the Organisation for Seismic Planning and Protection Efthymios Lekkas, they visited all the areas of Kos town that suffered damages. In statements afterward, Voridis noted that the town and island continues to function without particular problems, in spite of the strong earthquake, barring the damage to its port that must be quickly repaired. He also highlighted that none of the island’s hotels had suffered damage, indicating that the anti-seismic building code and the country’s civil engineers “have done a good job”. Next article Michael Psyllos Appointed New President & CEO of ALMA Bank.